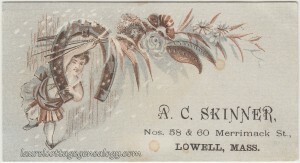 A. C. Skinner, Lowell, Mass. This is either a trade card or calling card or maybe a combination of both. 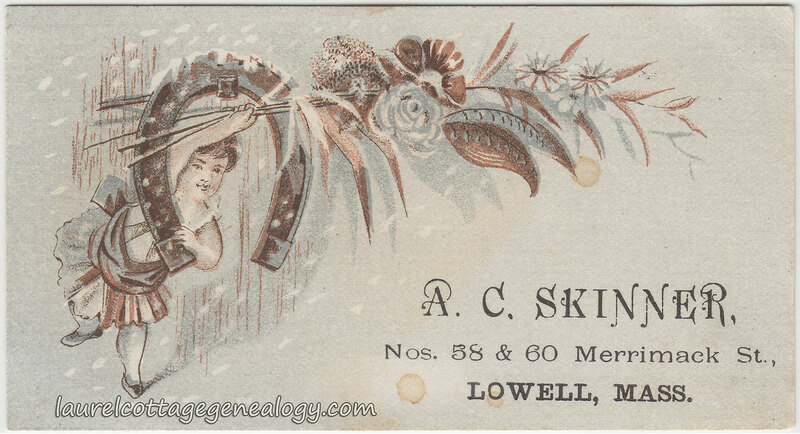 A. C. Skinner ran a “fancy goods” store at the address given on this card: Numbers 58 & 60 Merrimack St. in Lowell, Massachusetts. And the card shows a beautiful little design of a petite lady or elf, holding a few branches with various flowers and leaves; because of the copper and light blue-gray colors of the card they almost appear to be a dried flower arrangement. It’s sort of an awkward pose for the little elf, holding onto a horseshoe (which hangs from a nail) with one arm, and with the other outstretched above her head to display the flowers, and it’s snowing. A somewhat unexpected illustration and ever so charming. The long-time Lowell department store Bon Marché which operated from 1878 – 1976, had an early connection with A. C. Skinner. Bon Marché’s founder, Frederick Mitchell, once worked for A. C. Skinner. Sources: Ancestry.com. U.S. City Directories, 1821-1989. Various Lowell, Massachusetts city directories, 1866 – 1891. “Remembering Downtown Lowell’s Bon Marché through the Years, 1878-1976.” Forgotten New England, March 6, 2012. Web accessed February 1, 2015.